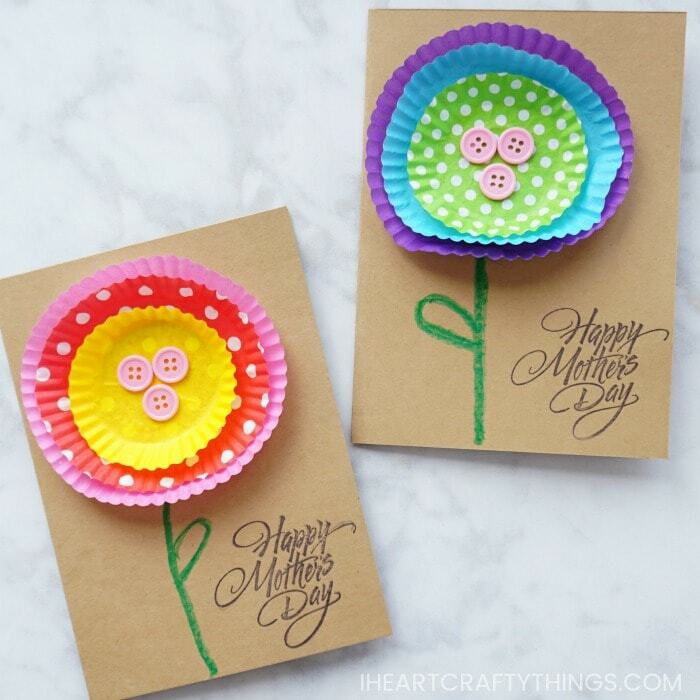 Of all the holidays in the year, we have definitely lacked in Mother’s Day and Father’s Day ideas here on I Heart Crafty Things. I’m hoping to remedy that this year with some fun ideas that kids can make for parents, grandparents aunts and uncles. 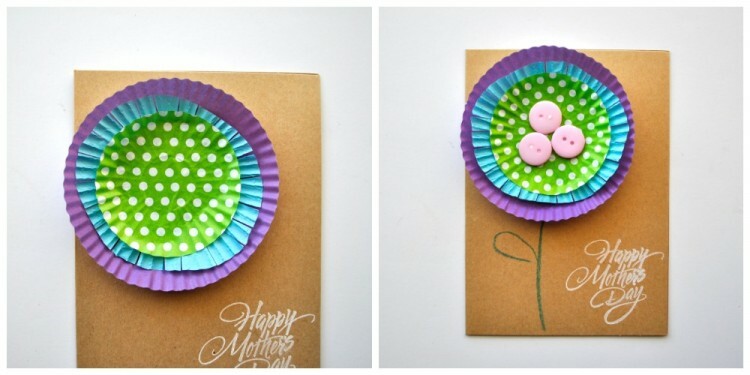 Today I’m sharing this simple but adorable kid-made Mother’s Day Card made out of one of our favorite materials, cupcake liners. Several of these cards can be whipped up in a jiffy and even preschoolers will be able to make and personalize them all on their own. 1. 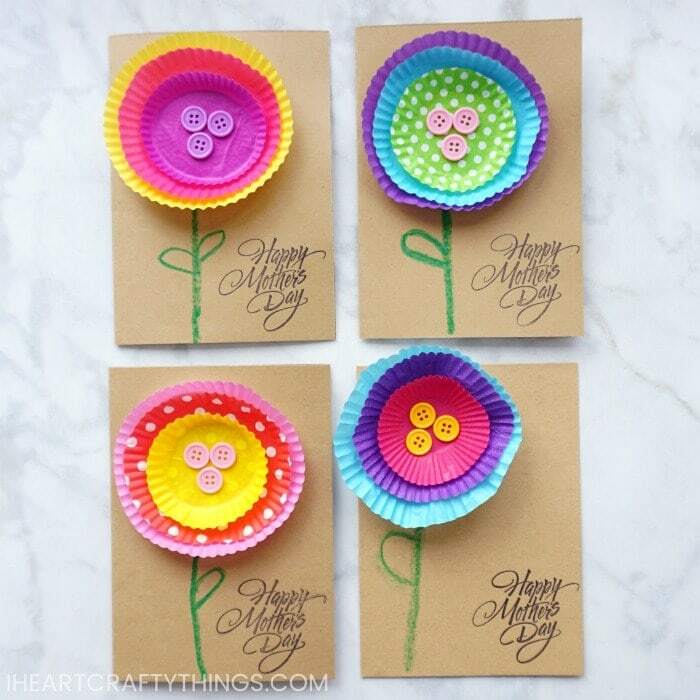 Start by stamping your Happy Mother’s Day stamp onto the bottom right corner of your blank card. We used both white ink and black ink but you can use any color you like. 2. Next glue a regular size cupcake liner onto the card with your glue stick. I left the edges unglued so they popped off the card some. 3. Take another regular sized cupcake liner, fold it in half and trim it down a bit. You can make the edge curvy, or make slits along the edge around the liner. However you want to customize your flower. Then glue it down on top of your other cupcake liner. 4. Layer your flower one more time by gluing a mini cupcake liner on top. 5. 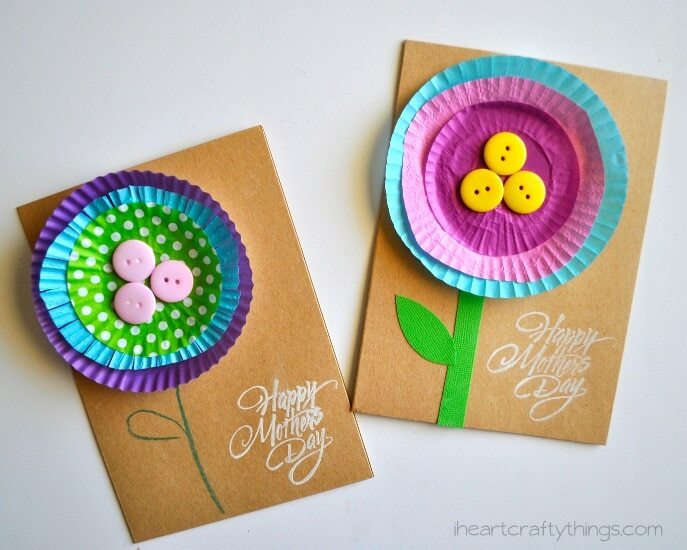 Glue a few brightly colored buttons in the center of your flower. 6. Finish your flower card by drawing a stem on your flower with your green crayon. We made a few variations of the stem. You could also use green cardstock paper for the stem, or green buttons. We plan to insert a picture on the inside of the card and write a personal message to Grandma’s for Mother’s Day. 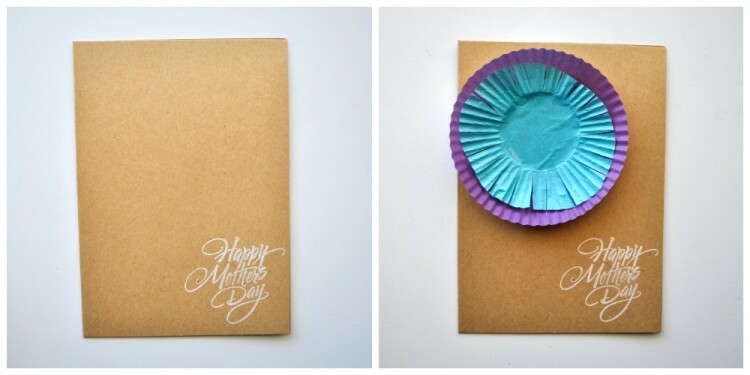 Looking for more simple kid-made Mother’s Day Cards? 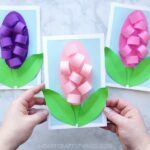 These Hyacinth Flower Mother’s Day Cards are another gorgeous flower card and the printable template makes them easy to make. Have a superhero Mom or Grandma? Make her one of these darling DIY Superhero Mother’s Day Cards. 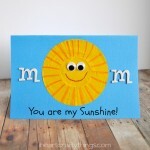 Cupcake liners can also be used to create this simple “You are my Sunshine Card” for Mother’s Day. 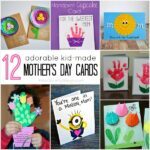 I've been looking for a preschool craft for my students to make for Mother's Day and this is the one! We DID make this card in my preschool class. The parents loved it. Thursday I have a post publishing with our works of art…this post is linked so that everyone can see where I got the idea! OH MY HEAVENS!!! Thank you for letting me know. I didn’t use their cupcake liners for my craft either so that is big time false advertising on their part. I am having a hard time finding any kind of contact info for them to send them an email. Have you had any luck? Thanks again! I made cupcake paper awards for a door contest one year, but I never thought of using them as flowers! How do you mail these? I have used your hyacinth, 3D tulips, hand print tree and the folded petal sunflower with a group of seniors in assisted living. Your designs are beautiful and easy for me to set up for craft time. I am going to do the cupcake line flowers but in a little different way. Thank you for all your wonderful crafts!! !